Susan Billy, California Pomo, learned basketmaking from her great-aunt, Elsie Allen. She is now a teacher and leader in basketry revival. The basket Susan was working on in 1985 when photographed at left is now finished. Light square in dark rectangle (lower left) is a dau, (weaver's choice of deliberate apparent error), the Spirit Door that lets good spirits in, and lets bad ones out, of the basket. Willow, sedge, redbud, 1 3/4 x 4 3/4"
"I feel that the generations before me tried all the different materials and found these to be the best, so I'm pretty strict on that. We use willow -- sometimes stripped, sometimes with a thin bark left on. Then we use 3 main colored fibers: white is sedge grass root, bullrush root for black, and new shoots of the redbud for a reddish-brown color. "We have to dig our own materials, they can't be bought anywhere, and it's very hard today to find the places where the materials grow and be able to gather them. The way that rivers have been dammed up, the way that the waters run different now, wipes out the roots and things that used to grow along the sides of the rivers. California Indian Basketmakers Association Refuses to endorse methods of a Federal-funded state-conducted study of the effects of pesticides on Indian basketmakers. This CNN news story is highly slanted and biassed (against the Indian women) who have good reasons to refuse to give their endorsement-by-cooperation to a study whose actual purpose seems highly questionable. Environmental objectives of CIBA focus on the elimination of pesticidal spraying. According to one of CIBA's founders, the reason California got th federal grant and is doing the study of affects on basket weavrs is bcause CIBA sought this for several years. But the way the study was set up led them after careful consideration to refuse to lnd a Native endorsement by participating. CNN News made no attempt to contact anyone from CIBA in preparing their biassed, slanted news story above. It took me -- without any contacts of knowledge of California Indian people -- just one day to locate a former CIBA officer, and learn about the situation, and later of the CIBA website, so it is quite clear that the CNN reporter 's slanted and biassed news story -- making the Indian group sappear to be unreasonable and uncooperative -- is deliberate. CIBA's efforts led to this study. Reluctantly after careful consideration of what the government was doing, they refused to cooperate. In anothr newws story a month later, CNN quoted a CIBA spokesman on som of the reasons. "Aerial and ground spraying has taken place for 25-30 years. In January, 1993, the CIBA Board of Directors met with the director and staff of the Cal EPA Dept. of Pesticide Regulation (DPR) and requested a moratorium on spraying of the lower Klamath River watershed. The request was denied, in a letter stating that restrictions on the use of pesticides 'must be based on hazards to humans and/or the environment stemming from use of the pesticides' and must have a 'scientific basis' for the limitation. " Eventually, CIBA's efforts led to a federal grant to supposedly provide the scientific information -- but the way the study is being conducted, the methodology of 'risk assessments', led the CIBA Board to reject this study, and to be careful not to appear to endorse the findings. Willow is the foundation of almost all 1 or 3-rod coiled baskets. Most used are species of salix willow that grow near water. 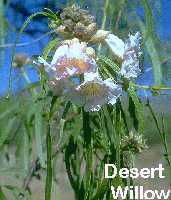 But this is a desert willow. Chilopsis linearis. Willow shoots are chosen for uniformity, but planed down to smoothness and uniformity by forcing them through holes or scraping. 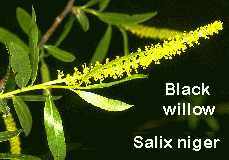 Black willow, a western-growing plant is one of the many salix species that grow large near water. New shoots (about 15 ") are picked in early spring, just as leaf buds form. 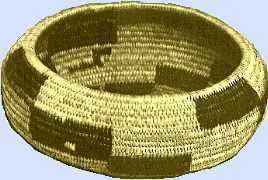 Wherever coiled baskets are made in an area where any kind of willow grows, that is usually the foundation -- the horizontal coils -- of the basket. 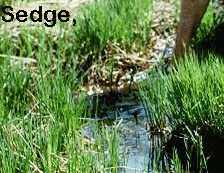 Sedge grasses, various species of Carex, grow in gravel-soil wetlands all over the world. Its fibrous rhizome rootstocks are split to form the pale buff-white weft or vertical wrap-sewing of fine-stitched coiled basketry. 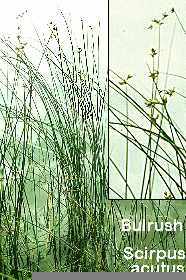 Bulrush, many species of Scirpus (this one grows in Wisconsin), is one of the two Pomo traditional pattern color plants. Digging the older plants with long, fibrous brown rootstocks cultivates a tight-packed stand of bulrush, helping new growth. Split into fine, narrow fibers, they are dyed black by being buried in wet ashes. Colors range from blackish brown to purplish to a lustrous, deep midnight black, depending on length of treatment, type of ash, and additives. Subtle pattern shadings come from using combinations of dark-dyed bulrush root fibers. 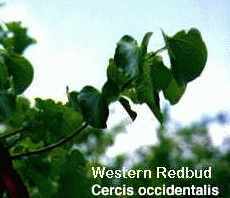 Western redbud, Cercis occidentalis, is the traditional Pomo source for red-colored designs in the weft. Shoots are picked in rainy winter for the darkest red color, and other times for shades varying from orange to brownish. They are de-barked, and uniformly sized by pulling them through ever-finer holes in tin can lids, then split, soaked, dried. CREDITS: Photo and quote of Susye Billy, Lost and Found Tradition, Coe collction catalog 1986, (out of print). I colorized her basket from the black and white photo. Sedge and bulrush photos are from Dr. Virginia Kline's photo lectures, on the University of Wisconsin (Madison) 5,000-botany images gopher. Black willow branch by Prof. Manhart, on the Texas A and M Botany images gateway. Western redbud on medical plants images gateway maintained by Michael Moore, head of the Southwestern School of Botannical Medicine. Not to teachers: if you plan to collect samples and don't know the plants, it's recommnded you visit these botany sources and check out vry large photos from which thse pix have been reduced. If in California, check out Laws about collecting wild plants in CA prepared for a University botany class there. Webmistress --Paula Giese. Explanatory text and graphics copyright 1995.